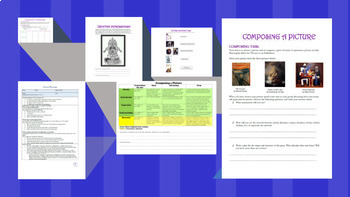 Included in this unit is a printable student booklets for music (15 pages) and art (12 pages). Each features historical information, comprehension questions, rubrics for reference and grading, student reflection pages, and colorful photos. Lesson plans spanning 11 weeks are also included. In both art and music, students are asked to complete three projects; an introductory project, a cross-curricular project, and a skills-based project. Both units could easily be expanded time-wise should students require more time in which to work. The focus in music is the work of Mussorgsky and how his music was influenced by the artwork of Victor Hartmann. After listening to some of Mussorgsky's works, students will learn to play a melody by Mussorgsky and then work towards composing two pieces of music; one based upon a famous piece of art and one based upon art they create in art. The focus in art is on the Impressionist movement. Students are asked to paint an Impressionist interpretation of one of Hartmann's pieces of art. They are then asked to create their own piece of Impressionism which will be used at the end of the music unit. Finally, students create an Impressionist artwork based upon a song composed by Mussorgsky. This is a great unit for those teacher interested in developing interdisciplinary practice or cross-curricular links in an integrated arts setting. Theoretically, the art and music units could stand alone with minor adjustments, but I would not recommend it as they have been designed to work in tandem.